I love the mix of textures, and color photos with black and white. It seems that I can never go wrong with Tiny Prints. Do you have a favorite online stationary store? Gorgeous! Perfect combination of photos. I really love his newborn photos...it would have been hard to pick just one, so I love how you used a bunch for his announcement. Look how tiny he looks in your arms! So adorable! I love the combination of all the pictures, family, baby, big brother, they are great! 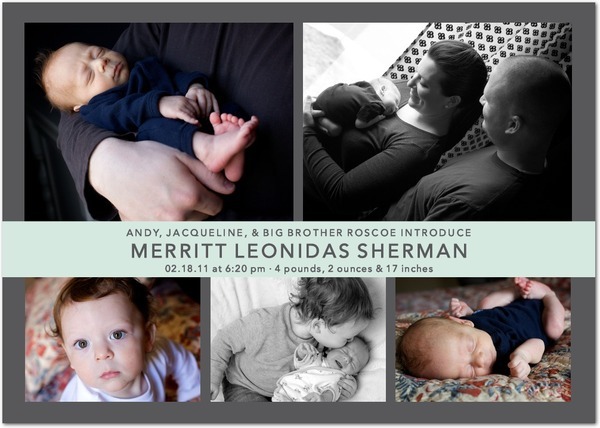 I might have you use this idea for my next set of birth announcements!